I asked an average Haitian living in Haiti: "Why does everything on the market cost "5 gourdes, 10 gourdes, 25 gourdes, 50 gourdes, 100 gourdes? OR WORSE... 100 DOLA... " His answer will shock you! Question: When was the last time you received less than 5 gourdes as change in Haiti? "Banm poze-w yon keksyon, Ki dènye fwa ou te gen YON goud nan pòsh ou?" I didn't have an answer. I don't remember the last time I had a '1 Gourde' in my pocket! And, honestly, the last time I saw a "50 Centimes" (half of a gourde) I took a picture, You probably have to go to a museum to see a "Degouden / 50 kòb" in Haiti. "E byen, se pwoblèm nan sa wi... Machann k-ap vann ou an pa gen monnen pou-l ba ou... Li chaje-w 5 goud pou tout bagay... Abitan ki vinn vann zoranj, sitron, ak epis nan mache-a, li lote tout a 5 goud! Si li vann ou pou goud e-dmi, kote l-pral jwen monnen pou-l ba ou?" "That IS the problem, " he says, "The the old merchant lady you are buying from does not have it either.."
"Since you don't have 'goud e-dmi' (1.50 gourdes) to give her for your purchase," he continues, and she cannot give you back '3 goud e-dmi' (3.50 gourdes) of change to return to you after your purchase, she charges you 5 gourdes for everything, for the same exact thing that is probably worth goud e-dmi. What are you going to do about it? You cannot bargain for less? So now, in Haiti, 5 gourdes (Yon dola haitien, Yon Adoken), is what you get back as change when you purchase out of 25, 50, or 100 gourdes. Yep... "5 gourdes" the least common denominator in Haitian Currency these days. It's the least you can spend for bread, candy, and anything that, once upon a time, cost "10 kòb"
What is the unit of currency in Haiti? Goud? Dola? 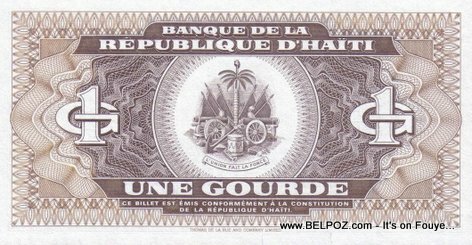 If the GOURDE is the unit of currency in Haiti, why is it that it is no where to be found? When was the last time you received less than 5 gourdes as change in Haiti? The last time I receive less than 5 gourdes of change in Haiti that was in 1993, I remembered my mom asked me to go buying rice, oil, and so one, after, I never see this again.